"We have an expression in the West that 'Whiskey is for drinking and water is for fighting over,'" said Chairman Paul Gosar. For centuries, Western states have fought over scarce water supplies. This scarcity led our visionary forefathers to build important federal water storage projects in order to provide water, hydropower, recreation, flood control and environmental benefits while adhering to state water rights. These were non-partisan endeavors – as evidenced by President John F. Kennedy dedicating the San Luis Dam in California. While the Central Arizona Project came after President Kennedy, it continues to bring prosperity to Arizona’s cities, tribal communities and ranches almost fifty years from its inception. The Glen Canyon Dam and other projects affiliated with the Colorado River Storage Project provided the backbone of a regional economy that produced year-round water and emissions-free hydropower. Lake Powell, the reservoir behind Glen Canyon allows for millions of dollars worth of recreational boating annually and even provided the scenery for the astronaut crash landing in the 1968 science fiction classic, the Planet of the Apes. For generations, these projects provided benefits to a growing society, but what the federal government helped give, it has been taking away. The current regulatory process for constructing new surface water storage is a bureaucratic maze that requires numerous permits and approvals from a multitude of different federal, state and local agencies. Conflicting requirements continue to cause unnecessary delays, kill jobs and result in us failing to capture precious water supplies. Ranchers, agricultural and municipal water providers, and other stakeholders need a clear process without the bureaucracy. Further, attempted water grabs by federal agencies during the Obama Administration were atrocious. From the Waters of the United States (WOTUS) rule, to the Ground Water Service Directive, or even the ski area water rights permitting conditions, the previous Administration attempted an all-out assault to take control of precious water resources that have traditionally been managed by states or private ownership. Members of the Western Caucus put forth a number of efforts to reject these overreaches as well as protect our vital water supplies. H.R. 1654 creates a one-stop permitting process for new water storage projects.This legislation will reduce conflicting permit mandates and allow critical water infrastructure projects to move forward in a timely manner. The bill also allows nonfederal public entities to contribute funds in order to help expedite permit applications for new projects. This important bill builds on the good work of previous generations, gets bureaucracy out of the way, and provides a clear process for pursuing important water infrastructure projects. The House of Representatives voted to pass H.R. 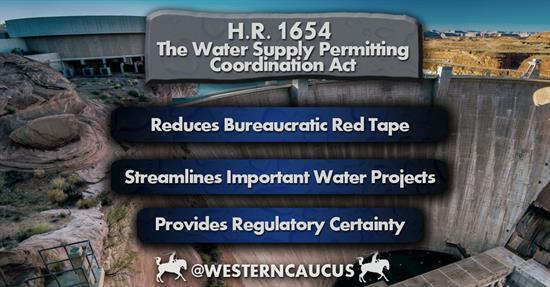 1654, the Water Supply Permitting Coordination Act, sponsored by Western Caucus MemberTom McClintock, by a bipartisan vote of 233-180. To read more click HERE. H.R. 3043 establishes FERC as the centralized body issuing deadlines and defining parameters for other agencies involved in the hydropower application review process in order to address delay and other issues. The bill represents a vision for the future of American hydropower and job creation wherein the necessary demands of regulatory compliance and environmental sustainability work together with emerging technologies to ensure maximal development of our nation’s energy production capacity. Hydropower has been a significant contributor to our country’s energy infrastructure, having played a major role in the creation and pathing of the modern energy grid. Hydropower infrastructure generates massive amounts of power, especially in Western States. In the 13 western-most states, hydropower contributes more than 22% of all electricity generation. The House passed Western Caucus Member Cathy McMorris Rodgers' H.R. 3043, the Hydropower Policy Modernization Act of 2017, by a vote of 257-166. To read more click HERE. In the 114th Congress, the House passed the Gosar-Newhouse amendment prevented any appropriations from being used to remove any federally-owned and operated dams. Extremist environmental groups have been pushing for their removal in recent years. These dams are critically important to provide water storage and irrigation for agriculture. To read more click HERE. There has long been a dispute brewing between the courts, federal regulators, environmental groups and industry regarding exactly what bodies of water fall under the purview of the Clean Water Act (CWA). The problem: the CWA gives the federal government authority to regulate “navigable waters of the United States” but does not define what the term means. The EPA and Army Corps of Engineers have defined “navigable waters” to include adjacent wetlands and tributaries. Neither agency has developed clear and concise definitions of adjacent wetlands or tributaries, causing great confusion in the regulated world. This results in CWA authority being defined through arbitrary determinations by federal bureaucrats. Depending on who is making the decision, the regulatory reach of the CWA has been interpreted to mean any physical connection or any potential connection where water, no matter how remote or infrequent, could eventually mix with navigable waters. Under that scenario, every sewer, curb, road, gutter, storm drain, tire rut and ditch could be required to meet the same water quality standards as rivers, lakes and reservoirs. This could potentially cost individuals and companies thousands of additional dollars complying with CWA provisions. The Obama Administration’s WOTUS rule embodied this extremist interpretation and would have caused significant harm to rural America, including farmers, ranchers, small businesses, water users and other property owners. This flawed mandate directly contradicts prior U.S. Supreme Court decisions, which imposed limits on the extent of federal Clean Water Act. 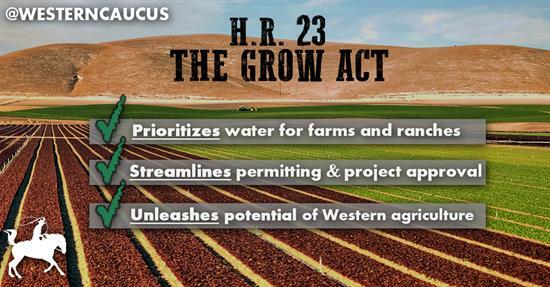 For years, Members of the Western Caucus introduced legislation, inserted funding riders into appropriations bills and passed at least five different measures through the House to block WOTUS. 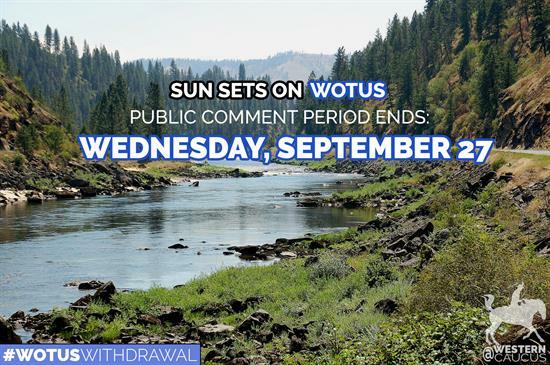 WOTUS was already stayed by the courts for its impressive unconstitutionality, but the Western Caucus nonetheless applauded the Administration’s move to listen to our members and issue a notice of proposed rulemaking to roll-back this hare-brained scheme. Click HERE to read more.